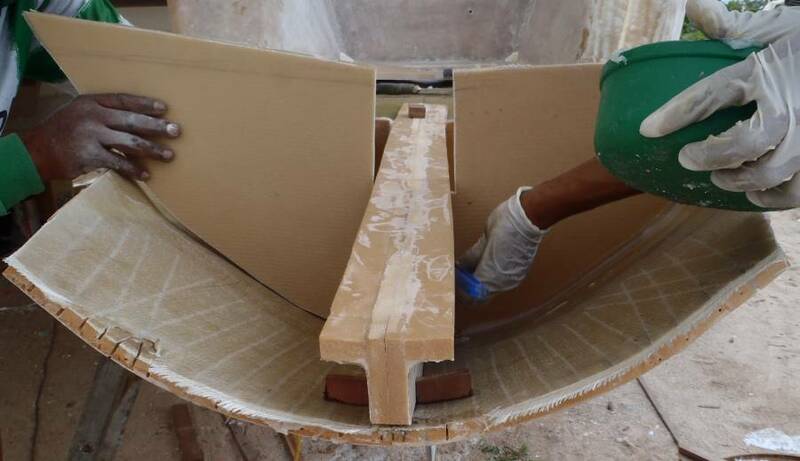 Summary: Houa used forms to bend each transom extension to be the same shape, then the team glassed them to that shape. They built and installed a central spine and 5 frame pieces (4 half‑frames and an end piece) in each extension, trimmed them down carefully to slope them correctly, and covered them with foam to completely enclose the extensions. Port extension got wrapped in 3 layers of biaxial glass while starboard was used to shape the foam for the outer wall leading down to the extension. Max and his brother Lek foamed both sides of the entryway and then glassed in the whole entryway area, including the steps. Jon removed both rudders and polished them up so we can install bigger lower bearings for them. Jon and Sue went to Bangkok and Phuket Town to get "retirement" visas that let them stay in Thailand for 1 year. Jon turned 57 on Saturday so we hosted a fun party with lots of food and drink. A good day (finally). Everything has been bottled up because of the new transom extensions not being the same. Golf gave Houa the job of fixing it (since he found the problems) but it's taken Houa some time and some thought. Today he finished a pair of identical forms for the ends of the extensions. 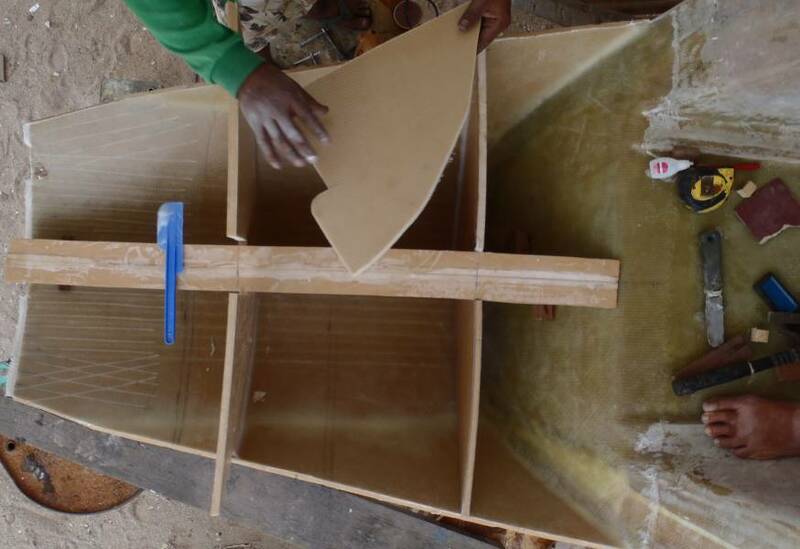 He sliced the top (inside) layer of fiberglass on both extensions several times with a carbide blade so they'd bend, and then clamped the end of the extensions to his new forms. He also tied the middle of the port extension with a "Spanish windlass" (a bit of rope twisted up to make it shorter) to bring the sides in a bit. Once Houa measured everything and pronounced that they were the same, the slices he made were filled with epoxy mud and glassed over, which should hold their shapes. Then the rest of the work could commence, starting with Baw rounding off (sanding) the joint‑lines so they don't stick out so much. The port side extension still needs the inside glassed a bit better, and then both sides need to get their spines fitted. These foam and fiberglass structures are already built and awaiting installation. But while they waited for the epoxy to cure, the guys made up the 8 half‑frames, 2 of which will go on each side of both spines. 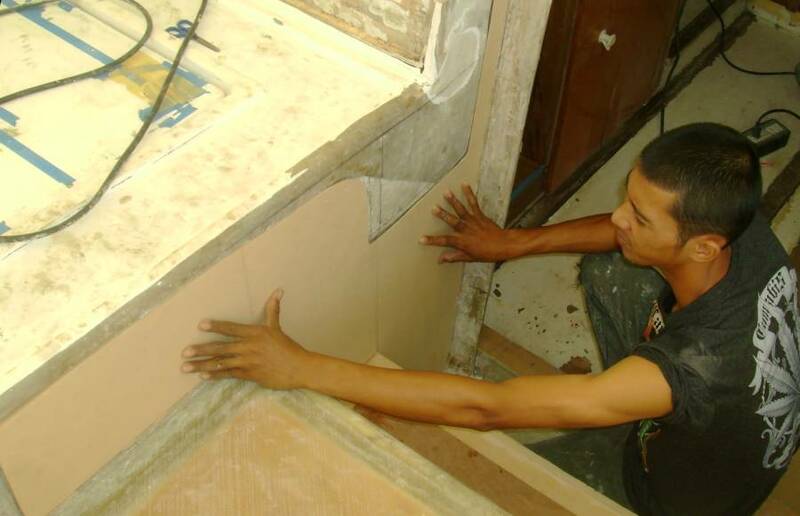 The foam was cut and they were getting their sides glassed at the end of the day. Upstairs, Max epoxied in the 2 foam sheets he'd prepared for the starboard side of the entryway. 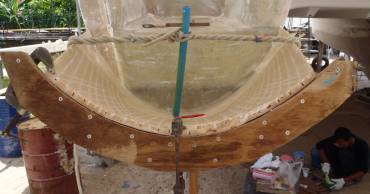 These needed to be braced against the port side, so he couldn't epoxy in the foam he'd prepared for port. On the topsides, Goy and Peak (pronounced Pee‑yak) continued their relentless long‑boarding. They're sort of the unsung heroes, as the work is brutal on their arms and takes forever but it's not very glamorous and doesn't show much progress unless you look closely. Neither one speaks any English, so we smile at them and give them encouragement whenever we can. Golf committed a bit of a tactical blunder yesterday -- he paid his workers. So when we walked into the boatyard this morning, only Houa was at work, although more straggled in as the day progressed. We hadn't realized before that every 2 weeks or so, Golf is late picking us up which sort of disguises the fact that the workers are late the day after pay day. On the way into the boatyard, Jon stopped off at the welding shop. The guy did a very poor job welding our anchor box back onto its support. Jon tried to goad him into doing a better job but there's too much of a language barrier. He explained to Golf later that he'd like to encourage the man to do a better job, but we'll probably have to have it done elsewhere. Two of the welds were broken and another was cracking when we first gave the box to the welder, so we know that the welds have to be strong. Today was very much a "Transom Extension" day. Max was taking his wife to the hospital again for another pre‑natal check, so he never came in. The day started with glassing the other sides of the frames that will go in the transom extensions (the first sides were done late yesterday). 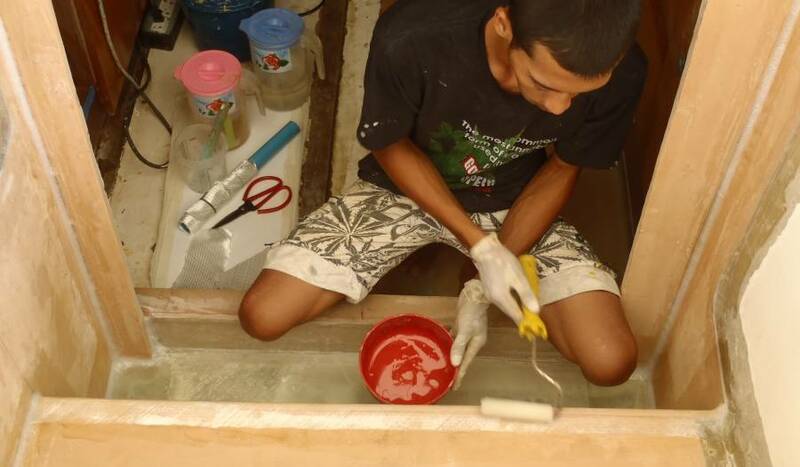 Since Golf was short‑handed, Jon pitched in and rolled out all the epoxy while Golf mixed up batches of epoxy and laid the pre‑cut glass on the foam. It was during this time that the first of our 2 rain‑squalls come through. This precipitated a mad scramble to get all foam and fiberglass under cover, especially the exposed foam on our extensions and any newly laid fiberglass. Luckily, these squalls rarely last longer than 30 minutes. Once the rain stopped we could move the glassed frames out into the sun to cure. After lunch the guys laid 2 sheets of biaxial glass on the inside of the port extension, bringing both extensions up to essentially the same status. Shortly after that we got our second rain squall, again causing everyone to get everything under cover. We hope the increased moisture doesn't affect the epoxy curing. Then Houa and Baw super‑glued little wooden blocks inside the starboard extension to position and hold up the central spine, and started cutting down the small triangular frames to fit on either side of the spine. Once they had things fitting together reasonably, they mixed up several batches of epoxy mud and glued everything together with nice fillets in the corners. These extensions should be extremely strong when they're finished! Tomorrow (Wednesday) we have to fly up to Bangkok to get an affidavit from the US Embassy saying we have enough money to stay in Thailand longer. Even having to buy $120 airline tickets, this is still the cheapest way extend our stay in Thailand. Why do they make it so difficult when we're contributing so much to their economy? So the pictures of Ocelot today were taken by Golf. It was raining for much of the day in Phuket, so they didn't get as much done as they'd planned, but that's actually OK with us, as we prefer to see big projects like these. 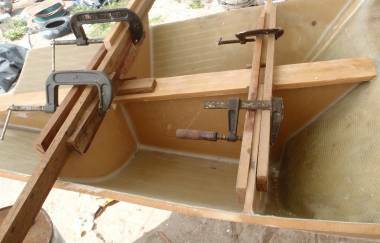 Houa trimmed the frames that were epoxied into the starboard extension yesterday. He checked all the heights to make sure everything would be level. This is a fiddly job, so it's good to have someone fairly meticulous like Houa doing it. Golf had hoped to get the top (swim platform) put on as well, but the rain wouldn't let him. 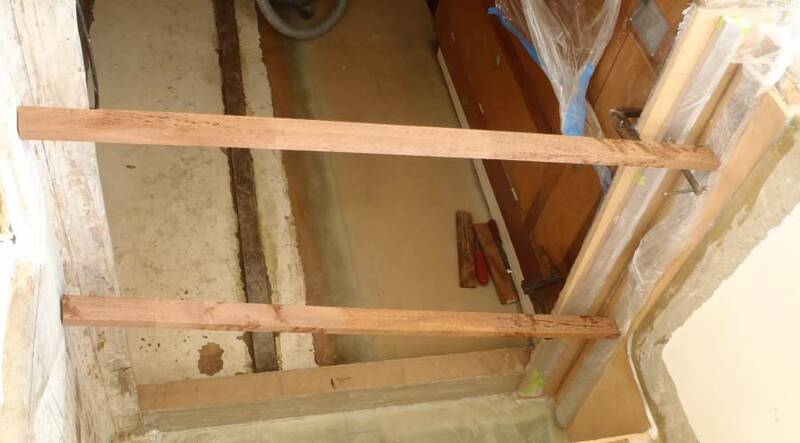 The furthest they got was to tape the corners (where they'd laid epoxy mud) with 2 layers of biaxial glass strips. Max got a bit further in the cockpit. He's working about in the center of our huge tent, so he's not as affected by the rain. He shaped and fitted a large and complex sheet of foam on the port side of our entryway. 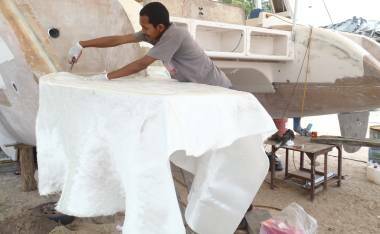 Then, during a break in the rain, he epoxied that and another smaller sheet of foam into place, putting a layer of biaxial glass under the foam for increased strength. Meanwhile, Baw was fitting the central spine into the port transom extension. Then he trimmed the frames down to size and fitted them in as well. Some of these were the sheets that had warped slightly when they were put in the sun to cure, so Baw decided to clamp them to straighten them out a bit. In this particular application, a bit of warp doesn't matter in the least, but it's nice to see the matter recognized and mitigated as much as possible. Towards the end of the day, the rain let up enough that Baw was able to mix up some epoxy mud and glue the spine and the 4 frame members into the port extension, with nice strong fillets in the corners. Thursday, April 5: A momentous day! 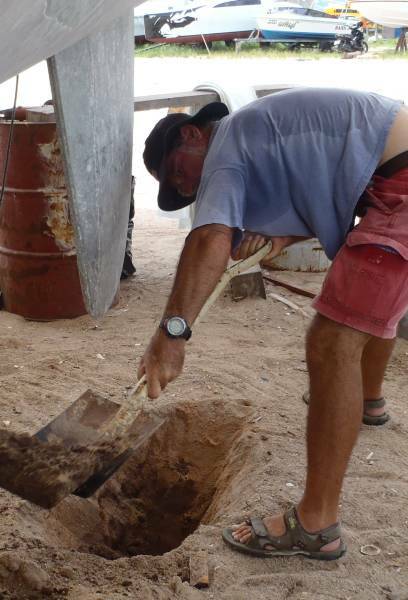 Got to the boatyard early and were relieved that the guys hadn't done as much as they'd hoped on Wednesday so we hadn't missed as much as we thought. Unfortunately, our battles with bureaucracy weren't over, as we still had to apply for visa extensions in Phuket Town. The guys were busy shaping and fitting foam, so we borrowed Golf's truck and drove to Immigration to apply for "retirement" visas. $300 and several hours later we have permission to stay and spend money in Thailand for another 15 months, with the downside that instead of it being free to leave the country and come back, it now costs us each $30. 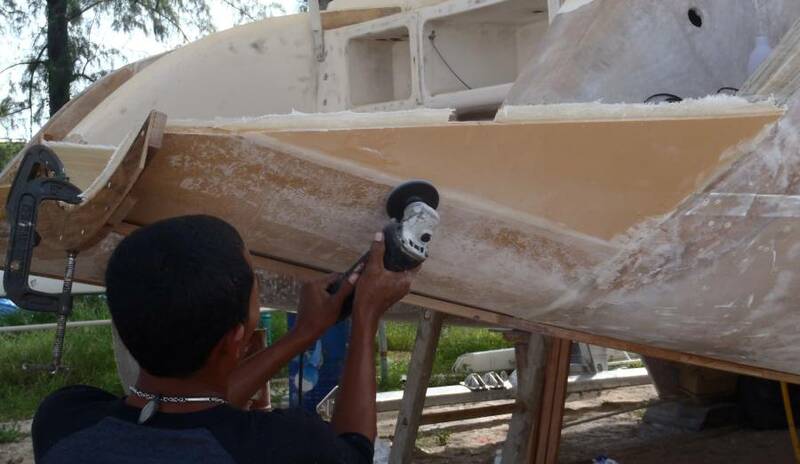 While we were gone the guys epoxied the top (swim platform) onto our starboard transom extension. This is just a sheet of foam with a single skin of biaxial glass on the underside for now, but it will soon get more fiberglass on the outside. Meanwhile, Max removed the plastic from the foam he'd epoxied in yesterday and sanded the foam clean. It looks very well done. 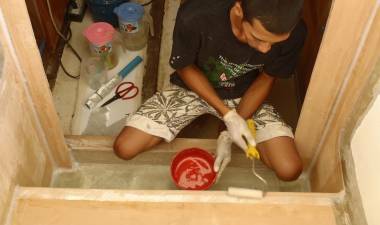 He spent the rest of the day trimming and preparing more foam to be epoxied in, and also checking the rails that our entryway sliding door runs in. These have to be mounted in a way that prevents all water from getting in. In fact, we want to build little drains in the bottom of the rails, so the water will drain to the outside. The mounting bolts will also need special attention, to make sure they're absolutely waterproof, and the ends of the rails will have to be capped so water can't escape out the ends (we think this is how water was making its way into the starboard aft cabin). 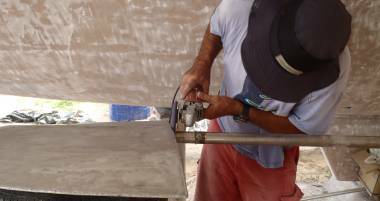 Work continued on the port extension, with Jon pitching in and helping epoxy 2 strips of biaxial glass into the filleted corners of the frames - sticky, fiddly work. When that was finished they mixed up a big batch of epoxy mud, smeared it on all the upper surfaces of the foam spine and frames, and then they laid the (pre‑trimmed) top onto the port extension! WOOT! 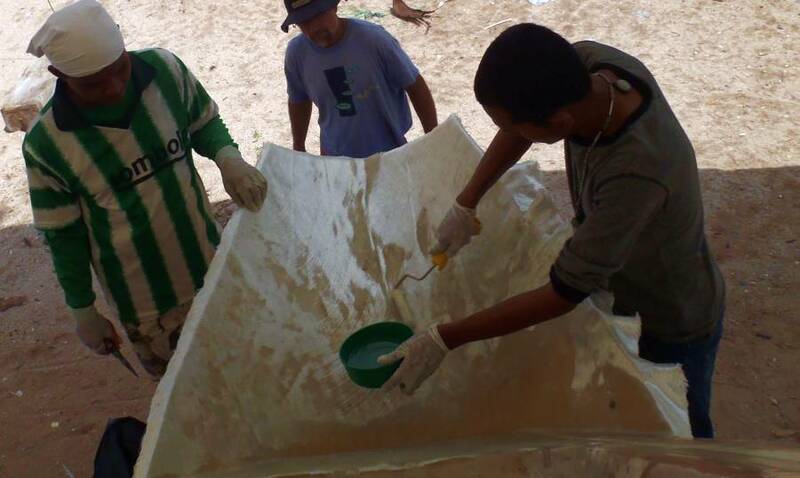 We covered the top in polyethylene and sat 4 big water‑jugs on top to make sure it gets well adhered to the underlying structure. So now we have both extensions completely closed in. They're still a bit delicate, as the outside is mostly exposed foam so susceptible to water damage, but we should be able to glass them in tomorrow. 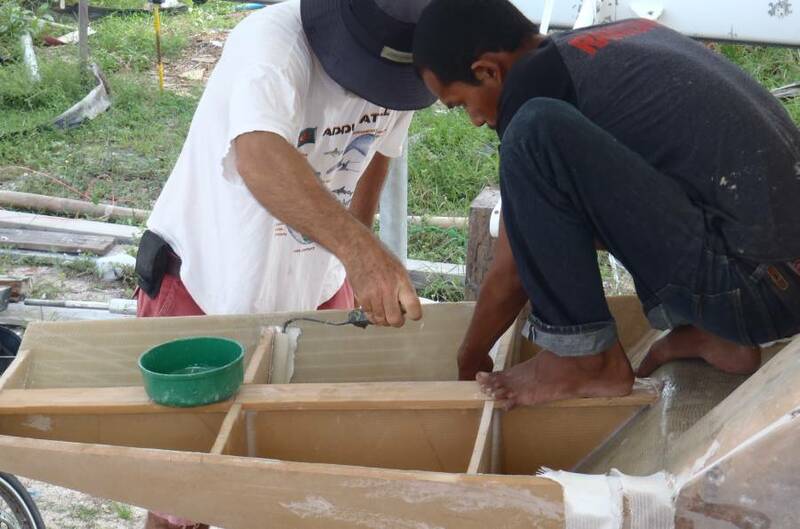 Just before the guys cleaned up for the day, Houa and Jon played with a strip of wood mounted between Ocelot's aft‑deck and the end of the starboard transom extension. This lets us see where we want to put the outer wall of our sugar‑scoops. The inner wall will be left pretty much as it is, but we want to build up the outer walls so they enclose our new extensions somewhat. Fun to start seeing what our final lines will look like! The day started out with a bit of excitement as our friends on Katani 2 got hauled out, power sprayed, and parked next to us. They were trying to give us time to finish our projects before coming out, as they are also using Golf to do their work, but the rainy season is coming and our work is taking too long. They'll probably get some of our workers, but Golf has already hired 2 more. On deck, Max's brother Lek has joined us. He started out by working with Max on the entryway. Together they installed 2 more bits of foam on the port side of the entryway, up high. Max is wonderfully meticulous, making sure the epoxy mud is filling all the cracks and bracing the foam as necessary to make sure it's well adhered. 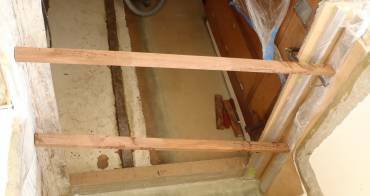 Today that involved long rods across the entryway, limiting access somewhat for a few hours. 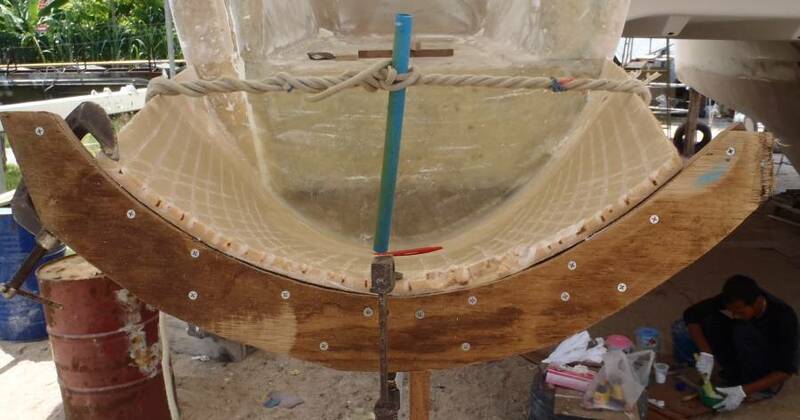 Once the epoxy had cured enough to remove the rods, they epoxied glass strips into the corners of all the bits of foam that Max has installed recently, followed by full sheets of biaxial glass over the entryway steps and the new foam on each side. We're very glad to see this, as that foam has been exposed for several days. Even without its covering fiberglass it's strong enough to walk on, but it doesn't like to get dirty or the fiberglass won't stick as well. While they were waiting for the epoxy to cure, Lek helped Baw cover the port extension with 3 full sheets of biaxial glass. Golf was going to put a couple layers on top before wrapping the sheets all around, but the top is going to get more foam and glass later for the swim‑ladder, so it will be very strong anyway. These are just the first layers of glass, but already it's pretty strong. Jon decided to grab a shovel and dig 2 holes to drop the rudders out. Luckily, the ground is basically sand, so easy to dig through. Then he set the rudders up on a drum and ground off all the old barnacles with a polishing disk. 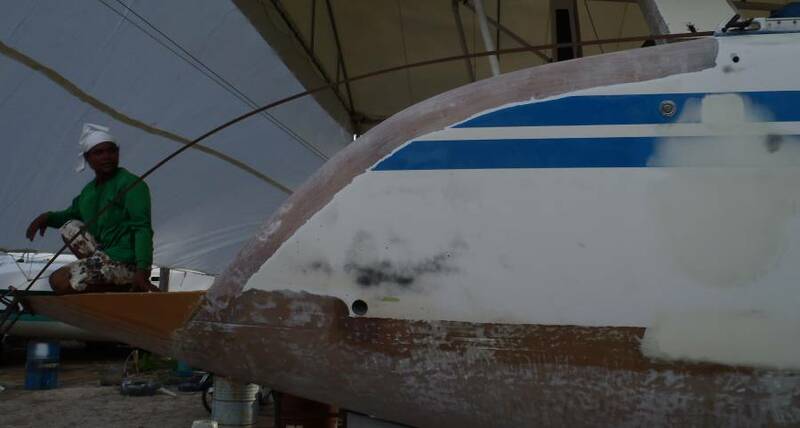 We've recently decided that we want to improve the bearings just above the rudder‑blades. First we'll get the stainless steel shop to weld on a thicker shaft section just above the blade. Then we'll dig out our existing bearing (the hard part), open the area up a bit, and epoxy a new, bigger plastic bearing. We'll probably also beef up the mounting for the new bearing with some fiberglass inside Ocelot. Golf assures us that this should all be easy to do. 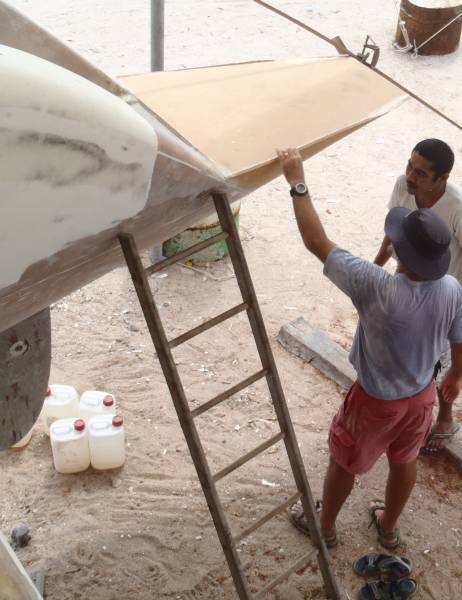 Finally, we'll coat the rudder blades in fiberglass and fair them down a bit for protection and better water flow. 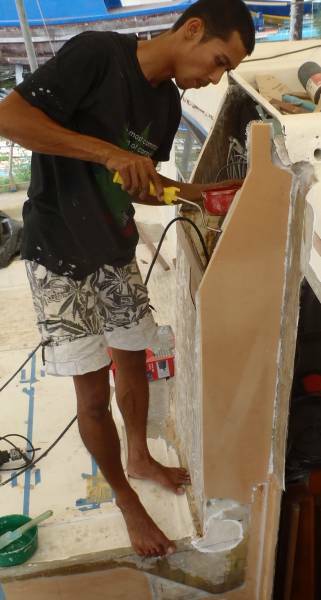 Houa was working on the starboard transom extension. Besides trimming it here and there to shape it better, he mounted some slats on Ocelot's side that he'll use for securing the foam railing that's to go from the deck down to the new extension. This will give Ocelot a somewhat racier profile, and make the extension look more like it was designed to be there instead of added later. Bit of a slow but celebratory day today. Part of that is because the crane arrived today to take Katani 2's mast and dagger‑boards out. They're not comfortable doing rigging stuff, so Jon helped them quite a bit, undoing turnbuckles once the crane was supporting the mast and helping to remove the roller gear. The main work today was shaping the foam for the outer walls of our extensions. 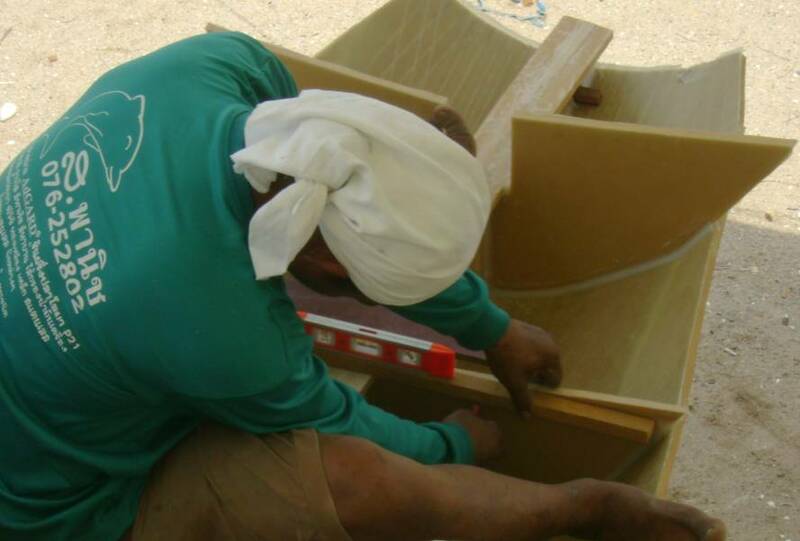 Houa built a wood frame and super‑glued it onto Ocelot's starboard side to outline where we want the outer wall to go. 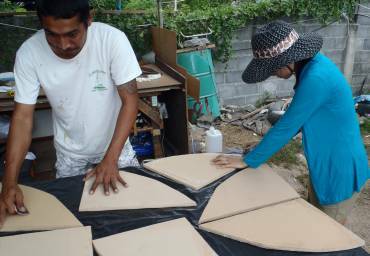 Then Baw and Lek cut and trimmed a sheet of foam to fit inside the wood frame. This was time consuming work, as they were working with a big sheet of foam. 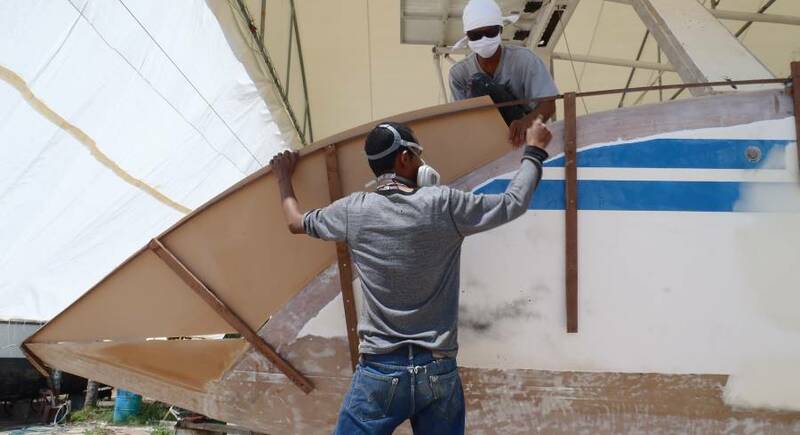 Once they got the sheet trimmed just the way it needed to be, they made a mirror image of it (for the port side) and then epoxied a sheet of biaxial glass to the outside of each sheet. This is enough to protect that side and make the foam more robust, but still keep it flexible. Max continued his work around the entryway. Today he was focusing on our helm area. The existing glass here is so thin and wobbly that it doesn't really hold its shape, and it would be impossible to bond any foam to it. So Max spent most of the day building a wooden support to go behind the fiberglass, so we can push the foam against the glass without distorting the shape of the glass. But the main event today was Jon's 57th birthday. We'd told Golf earlier that we wanted to buy all the guys lunch, something nice that they wouldn't usually get. So Golf brought back some lovely rice with chicken or pork wrapped in a banana leaf, with sauces to go on top. The meals came with soups, delivered in plastic bags with rubber bands holding them closed. 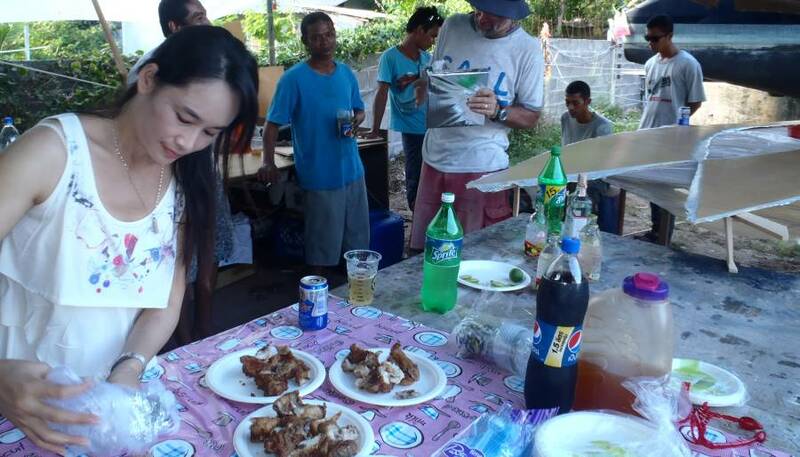 It sounds strange, but LOTS of food‑to‑go is served this way here. 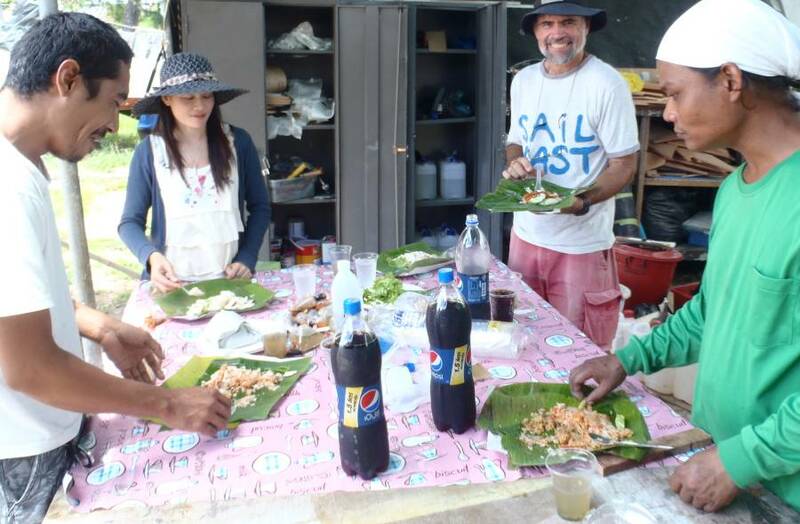 So we provided drinks and everyone had a lovely large lunch. Golf had invited us to join him and his wife at a car and sound system show that usually happens on Saturday night, but just before we were supposed to go the heavens opened up in a huge storm. We were worried about all the exposed foam on Ocelot but Golf assured us that Houa and Max were still at the boatyard and had wrapped all the exposed foam in plastic to protect it.